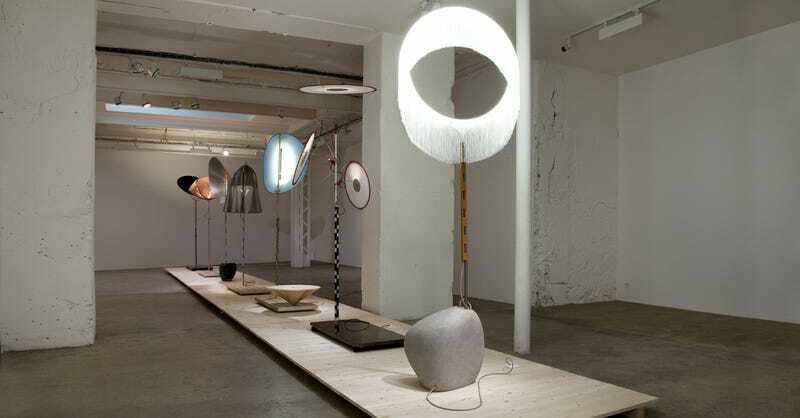 Dutch furniture designer Wieki Somers is based in Rotterdam—but for her latest collection of bizarre lamps, she travelled east, to the land of the rising sun, where she found inspiration in the form of Samurai flags, Geisha culture, and traditional Japanese gardening techniques. The series is called Mitate, which, according to the studio, "signifies the perception of an object in a non-habitual way, to contemplate an object as if it were something else in order to renew its meaning and experience." We interpret that as making old things interesting again, through odd, albeit intriguing, designs. For example, this lamp, called Chuugi, is perhaps the most obvious representation. It's based on the fabric that geishas would use to shield their skin, and it looks like a parasol. The Jin lamp requires a bit more explanation. It's inspired by the traditional flags Samurai used to wear with their armor to identify which clan they belonged to. The Rei lamp takes inspiration from traditional Japanese dolls, some of which look like they're carrying several hats at the same time. Here we have the Gi lamp, which if the rock at the base is any indication, is representative of zen stone gardens. And here are some preliminary sketches of the entire collection, done in traditional watercolors.